We love the retro look of these colorful lights. 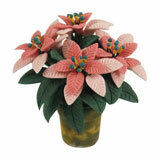 Each bulb is slightly larger than 1/4" in diameter and doubles as an ornament. 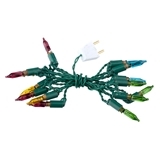 The 12 multi-colored bulbs span 21" of the string. Includes plug. on 12/3/2011 Making Spirits (and dollhouses) BRIGHT! These are such fun little lights! Not only do they double as tree ornaments with little siver caps, but they look fantastic when lit! I decorated my mini Christmas tree (Item #: 69500 ) with them, and it looks magical. 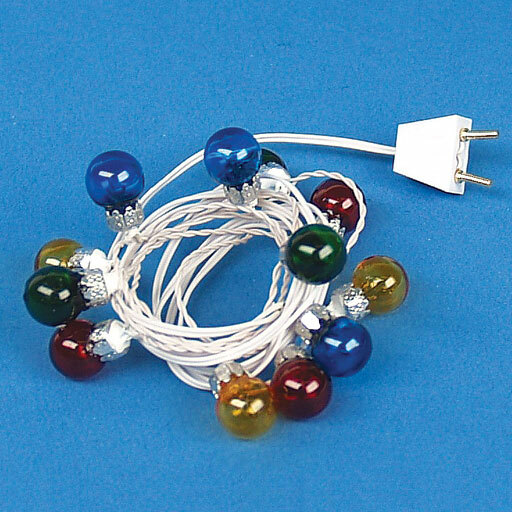 The white cord would work well with white exterior trim on a dollhouse, should you desire "outside" holiday lighting. 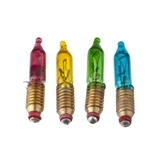 I imagine these lights would look best on either a frosted/snowy Christmas tree, or one so heavily decked with ornaments that you wouldn't notice the white cord. It's very easy to "stuff" the wiring out of sight inside mini Christmas tree "branches", and the generously long cord/plug make it convenient to place anywhere desired in a mini room scene.